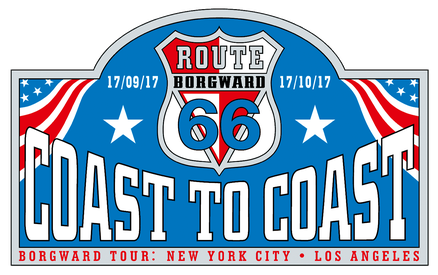 The Borgward Route 66 Travel Blog - borgwardroute66s Webseite! In September/October 2017, the UK Borgward Drivers Club and the Borgward Club Belgie have planned a big Borgward road trip through the United States. Over a period of over a month, we will drive our Borgward's from New York City to the start of the Route 66 in Chicago, then follow Route 66 finishing at the 2017 US Borgward Owners Club meeting in Santa Barbara California. People from Belgium, the United Kingdom, Germany and Luxembourg have registered. Our cars will be shipped RoRo from Europe to New York early September, and then we will drive north side along the Hudson River, through the Catskills, pass the Finger lakes to the Niagara Falls. This is where we will have our first rendezvous with Borgward owners from Canada and the North of the US. From here on, we will drive alongside Lake Erie via Cleveland to Chicago. From Chicago we will try to follow the legendary Route 66 as much as possible to Arizona where the California members of the US Borgward Owners Club will meet us. We will drive towards Los Angeles, and then via the Pacific Coastal Highway to Santa Barbara where the actual Borgward meeting will take place. During our Route 66 journey, more US club members from the Eastern and Northern States will be joining us. There are several possible departure dates, but all participants must be in New York on or before September 17. We will collect our cars Monday 18 September 2017, and our grand tour starts the following morning, Tuesday the 19th September 2017. The total distance that we cover is about 8000 km. That is a very great distance in a relatively short time, but it is definitely a unique experience, with lots of sights along the way, far too many to mention them all. It promises to be a fantastic once in a lifetime experience. More information can be found on the UK Borgward Drivers Club website or the Borgward Club Belgie website. Another great source of information around Borgward Oldtimers is www.borgward-ig.de .